Author of "The Cult Of Incompetence,"
Translated from the French by Sir Homer Gordon, Bart. 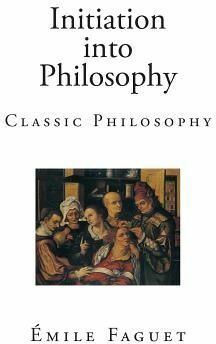 PHILOSOPHY.--The aim of philosophy is to seek the explanation of all things: the quest is for the first causes of everything, and also how all things are, and finally why, with what design, with a view to what, things are. That is why, taking "principle" in all the senses of the word, it has been called the science of first principles. Philosophy has always existed. Religions--all religions--are philosophies. They are indeed the most complete. But, apart from religions, men have sought the causes and principles of everything and endeavoured to acquire general ideas. These researches apart from religious dogmas in pagan antiquity are the only ones with which we are here to be concerned. This volume, as indicated by the title, is designed to show the way to the beginner, to satisfy and more especially to excite his initial curiosity. It affords an adequate idea of the march of facts and of ideas. The reader is led, somewhat rapidly, from the remote origins to the most recent efforts of the human mind. It should be a convenient repertory to which the mind may revert in order to see broadly the general opinion of an epoch--and what connected it with those that followed or preceded it. It aims above all at being a frame in which can conveniently be inscribed, in the course of further studies, new conceptions more detailed and more thoroughly examined. It will have fulfilled its design should it incite to research and meditation, and if it prepares for them correctly. Faguet was born at La Roche-sur-Yon, VendEe, and educated at the Ecole normale supErieure in Paris. After teaching for some time in La Rochelle and Bordeaux, he returned to Paris to act as assistant professor of poetry in the university. He became professor in 1897. He was elected to the AcadEmie franCaise in 1900, and received the ribbon of the LEgion d'honneur in the next year. He acted as dramatic critic to the Soleil; from 1892 he was literary critic to the Revue Bleue; and in 1896 took the place of Jules LemaItre on the Journal des dEbats. He died in Paris, aged 68.